Discussion in 'Tarantula Chat' started by Storm76, Feb 2, 2016. This species was first described in 1994, by F. Saager and hails from Venezuela. To be more exact: Reportedly especially the areas around San Ignacio, St.Elena, Roraima-Tepui, Gran Sabana, Estado Guyana. They were first spotted in March 1991 – so it took 3 years for them to make it into the described species list. I will include links to the relevant references at the end of the post. For more detailed information, look there. P. irminia are one of the most beautiful tarantulas out there (alright – I'm biased since they're my favorite actually!) with their orange chevrons on the legs and the tiger stripes on the abdomen it brought them the nickname „Nike spider“. The prominent color is black, aside from those striking markings and a somewhat greenish carapace. The look of their legs is often compared to „pipe-cleaners“ as the satae on them are very feathery. In addition, this is a New World species, but lacks any urticating bristles which can usually be found on NW tarantulas. None of the described species in the genus has any, instead they're very agile and carry a stronger venom (later more about this). The species is sexually dimorphic and males, aside being a good idea smaller than the females, look very drab grey instead of black once mature. The maximum size for these is reportedly 5-6“ for an adult female, personally I haven't seen one over 5.5“ thus far. Both of my girls are around 5.25-5.5“. Males max out at around 4-4.5". The climate in the regions mentioned above is humid and considered tropical rainforest (Climate diagram example for St. Elena CLICKY) except for the dry-season during the summer months. Interestingly, smaller specimens seem to seek the warmer spots, while older rather use the cooler shades. Despite the fact that this is an arboreal species, it should be mentioned that they tend to live semi-arboreal in captivity. In their habitat, they can usually be found on the bark of trees, in holes of the same, or even lower to the ground around the roots. Sacs from this species carry between 50-200 eggs and the genus is able to double-clutch (dropping another sac after molting) without another pairing, although this isn't guaranteed to happen. Corkbark-tube or -slab leaned against one side of the enclosure, a few plastic plant pieces or natural plants (I prefer the first since it's less maintenance) and around ~3“ of substrate. Eco-Earth works best for them due to their predisposition to build an underground chamber below their hide, but you can use cocofiber, too. Personally, I keep the substrate slightly moist, letting it dry out during the summer as it does in their natural habitat. Don't create a swamp, though! A waterdish and good ventilation round out the decorations necessary. Adults do well in 2.5 – 5 gal tanks with good ventilation at 20-28°C – KritterKeepers should NOT be used for these! Letting the sub dry out some during summer, helps keeping it close to what they're used to in nature. If you decide to get this species, no matter as spiderling to raise yourself, or a juvie / adult already – do not expect to see them a lot! Especially during the day, these usually stay hidden and are mainly out between 9pm and 3am judging from my couple females. Oh and did I mention they tend to web up any spots that you could peek in on them from? Typical behavior for them. In terms of feeding they eat pretty much anything from roaches, crickets, mealworms, superworms or even locusts. I never had to feed prekilled at any point while raising them. 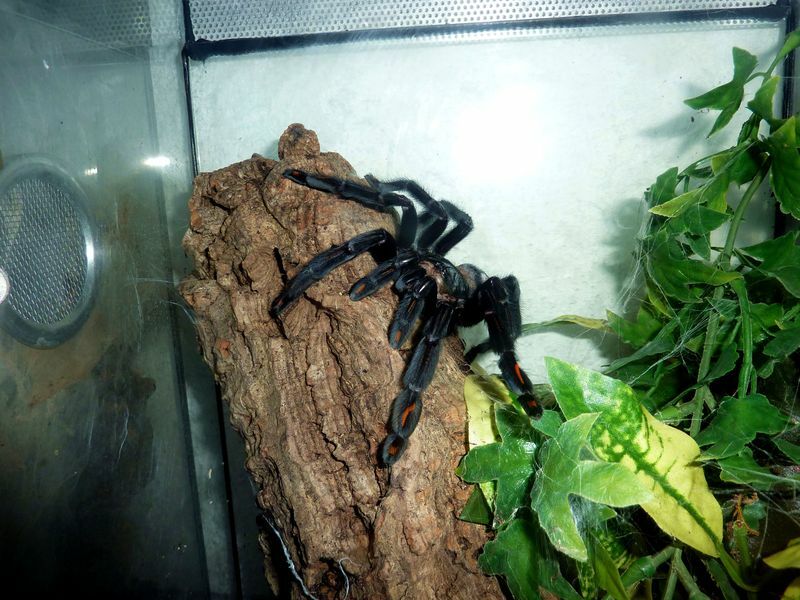 Out of the whole genus, this particular species is probably the most defensive (due to pretty low threshold for disturbances), in additition to being teleporters with their extreme speed and agility, this doesn't really qualify them as a good choice for 1st tarantula. If disturbed, for the most part they will immediately vanish into their hide, but a fair amount are more confrontational than the rest. One of my females will retaliate any disturbance immediately with a threat-posture, fangs bared and, if -really- annoyed: Venom dripping. She would charge to the top of the enclosure at times to let me know it's time to back off. Interestingly, this is the one I raised from a sling. The other one, that was my 1st tarantula (yes – it can be done, but not everyone is prepared for what they have in store for potential keepers) is very laid back actually. I think one particular statement should defininately be mentioned here: Psalmopoeus spp. Are very unpredictable and they often give you more grief than, say a Poecilotheria spp because of that. One may ask „Why?“ now and the explanation to that isn't easy. Don't get me wrong: I truely love the whole genus – no questions asked! 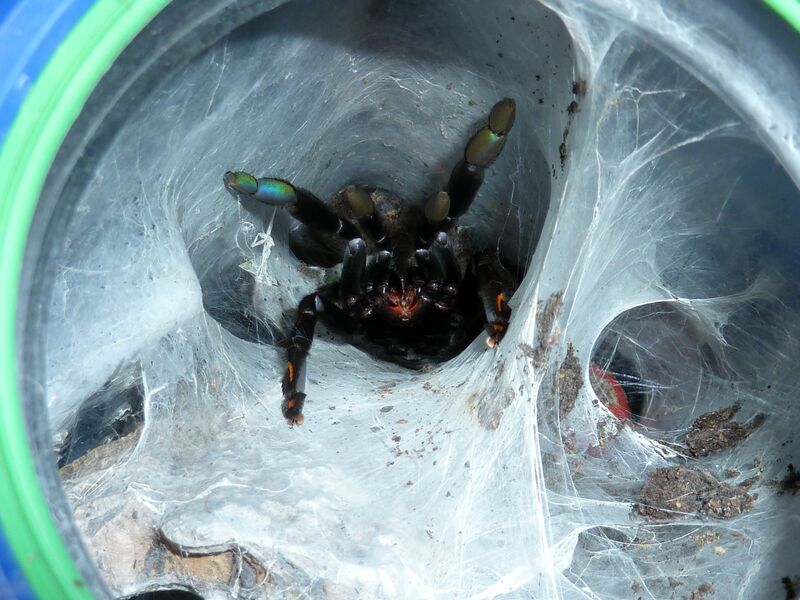 I've kept pulcher, langenbucheri and still have a couple irminia and one cambridgei – so I've made my experiences! But the fact is that these have the trick to lull their keepers into a sense of false security and then suddenly exploding! These can jump pretty accurately, too! Since their venom is more on the strong side (very painful since the three Vanillotoxins within the venom target the same neuronal receptor that capsaicin does (the alkaloid from hot chili peppers , also known as TRPV1 which causes the burning sensation)) and can cause systemic reactions like vomitting, sweating, lightheadedness and muscle-spasms for a couple days. However, most bite victims state that aside the pain of the extremity the bite happened on, all symptoms were gone by the next day. From my own experience I will say that bites are very unlikely to happen – responsible care of the animal provided! Have a catchcup ready at all times in case of an escape – they're lightning-fast if they want to. Other than that, do not prod them with anything unless absolutely necessary (rehousing i.e.) as they will usually go into defense-mode or teleport away. Rehousing should be done in an area in which the spider can't escape from you into spots where it'll be problematic to retrieve them – it has proven useful to have a couple towels on the ground for the animal to hide underneath in case they take a run. A catchcup with a small hole fitting for a soft straw has proven the best helper for me towards that end. Extremely beautiful and fast, pretty defensive and very reclusive generally equals not a good starting choice into the hobby in my opinion. For all others: Psalmopoeus irminia is the best looking of the genus and they're easy to raise and keep (some experience with arboreal tarantula care and common sense provided) and many suggest them as the 2nd step towards a Poecilotheria spp., myself included. There's a reason why those of us keeping them call it a real treat if they show up – because we're all deprived of their appearance as they prefer to come out when they aren't being watched. Aside that – awesome genus, awesome species and one of my personal recommendations for any collection! In terms of keeping, the above can be applied to every other Psalmopeus spp., too. The setup of their enclosures is exactly the same and their behavior varies only to some degree, with P. Langenbucheri being the dwarf of the genus with max. 4“. There, I did it. This species is very common and cheap to come by, yet many ask about them despite the fact that there's already tons of info on the net about them – including on here. Perhaps this (admittedly biased) view helps some people decide nevertheless. ...and adult with the complimentary attitude...*sigh* Her way of greeting me upon opening the enclosure. Psalmopoeus irminiaSaager, 1994: 59, f. 2-5, 6A, 7-11 (Dmf). Psalmopoeus irminiaPeters, 2000b: 90, f. 258-259 (mf). Psalmopoeus irminiaPeters, 2003: 275, f. 1101, 1103-1104 (mf). Psalmopoeus irminiaSchmidt, 2003l: 204, f. 600-602 (mf). Psalmopoeus irminiaSchmidt, Bullmer & Thierer-Lutz, 2006: 8, f. 11, 13 (mf). Psalmopoeus irminiaMendoza, 2014b: 734, f. 17 (m). Tought that only Psalmopoeus cambridgei Vanillotoxins were able to trigger that TRPV1 "Chili" nasty effect. Good work as usual btw man. Tought that only Psalmopoeus cambridgei Vanillotoxins were able to trigger that TRPV1. Good work as usual btw man. The venom is pretty similiar, not exactly the same, but the pain inducing Vanillotoxins are present in irminia as well. Also, thank you. interacting with residues in the presumptive pore-forming region of the channel, highlighting the importance of conformational changes in the outer pore region of TRP channels during activation." Awesome Job!! I just love it when my girl shows up to let me gaze upon her beauty. Yet again, awesome info Jan. Personally these are a must-have. Another thing regarding double clutching. I could be wrong so correct me if I am. But isn't it dropping two sacs from one pairing before molting? As far as my knowledge goes if they molt after being paired they must be paired up again with a male before they'll be able to drop a sac? We're did you get the closer look idea from ???? This was seriously an enjoyable read. Very nicely written. I am very fond of my adult female, very laid back relative to other arboreals I have. I was actually contemplating disturbing her hide, something I almost never do, as I had not seen her in a couple months. Then, just like magic a beautiful, perfect molt was left at the front of her enclosure for me to remove. Still haven't seen her but I know she's fine, and that's all that matters. I dunno really, I simply figured it a good thread-title and have used it for some other species, too. Besides, there's tons of information all over the net, this forum, the BTS forums and lots of other places, too. Psalmopoeus is a pretty popular genus and spiderlings are pretty cheap, easy to raise and great to keep if one can wrap their head around the idea of a tank whose inhabitant isn't visible all too often . The majority are around 5" adult. Very nice! I have a sling that's around 1" or maybe a little larger. I've noticed it actually spends a good deal of time hanging out on the bark above its burrow. I'm hoping that behavior continues into adulthood. I wouldn't count on it, but who knows? Great article, Storm. I'm on my second irminia, she's about an inch and a half now. She spends most of her time in her chamber beneath the cork bark. It's neat to watch her sometimes pull prey through the chamber wall. Much appreciated Storm. Nice touch adding in the toxin info re the receptor TRPV family. I'm sure lay people will appreciate that. Much appreciated the locality info as well! Great write up! Thanks for all of the information! I have an adult male(pretty sure it's a male..). He's definitely been more the type to retreat then hold his ground but I never really disturb him. I have a question though, I have him in a Kritter Keeper right now. Should I rehouse him? If so, you mention not to prod them to rehouse them. What method do you use? Thanks again for writing this up! Great info! I personally don't like them being housed in those KKs. Yes, they're semi-arboreal, but a KritterKeeper is not an enclosure for anything arboreal at all! 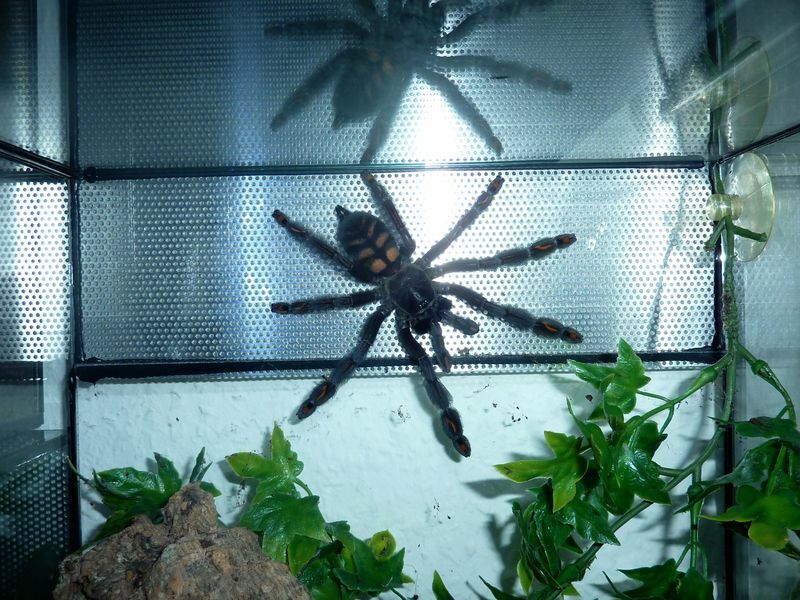 For a lot of terrestrials its a cheap way of housing them, for graceful, fast and somewhat feisty genera like Psalmopoeus I'd always house them in either acrylic or glass arboreal enclosure with the measurements stated in my OP. Obviously, for P. cambridgei the final enclosure needs to be a bit bigger. As for transfer: I didn't say don't prod them, I said don't overdo it - huge difference! I always used a plastic cup with a hole on top for a soft straw to use through there. It's a pretty simple, cheap and secure way for both parties. Thank you for the information! Very helpful. Looks like I'll be rehousing mine then Thanks! Very nice! On instagram one day, I had about three people in a row, after a little feeding video I made with my irminia, tell me I'm keeping them wrong. Told me they shouldn't be living under ground because they are arboreal. I about lost it. Apparently a lot of people don't realize about their burrowing / web curtain tendencies. Glad to see someone doing a nice write up on them. Thanks! Great write-up. My mature male got way more defensive after maturing a few weeks ago. I knew their venom was a bit more painful than that of other NW T's, although now I have even more respect for him haha. Actually about kritter keepers, it's possible to do this if you don't have anything else at the time. Btw, I'm new to this forum and I cant find a specific category in the forum that's meant for posting articles like these (Species info/Care sheets). I think there should be.